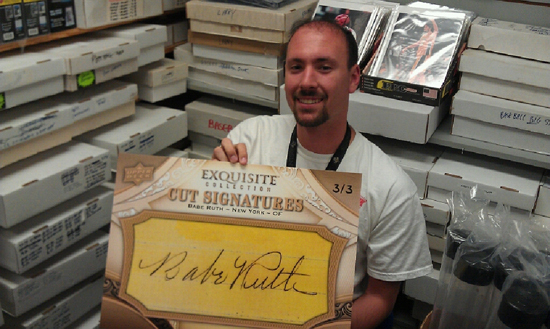 Yesterday was a busy day for me as I braved southern California traffic and visited two shops who were both busy with the release of 2011 SP Legendary Cuts Baseball. The first shop I visited was Taylor’s Baseball Cards and it was good to chat with Joe who does a great job of taking care of collectors up there. I had just missed some of the product being opened, but couldn’t stay long as I had to get further north for the main event. 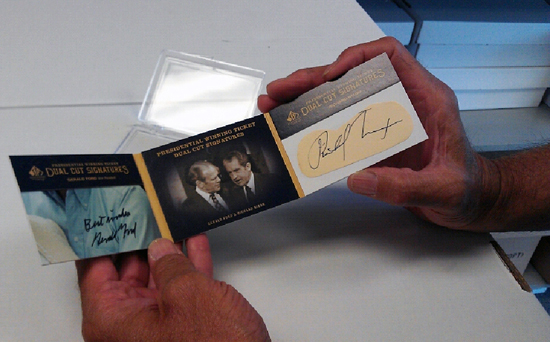 By the time I arrived one customer had already pulled a dual Presidential cut card featuring signatures of Gerald Ford and Richard Nixon. 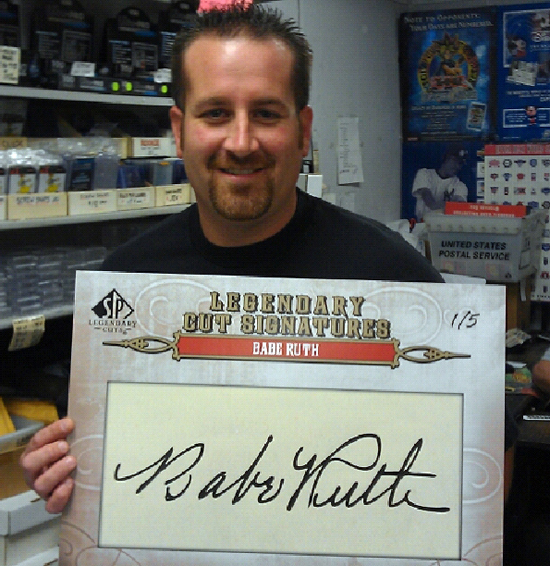 A collector at The Card Connection shows off a Ruth blow-up card he won during a giveaway. A rare Exquisite Pie Traynor cut along with a dual cut of Bill Dickey and Yogi Berra. Another happy collector with a Ruth blow-up. 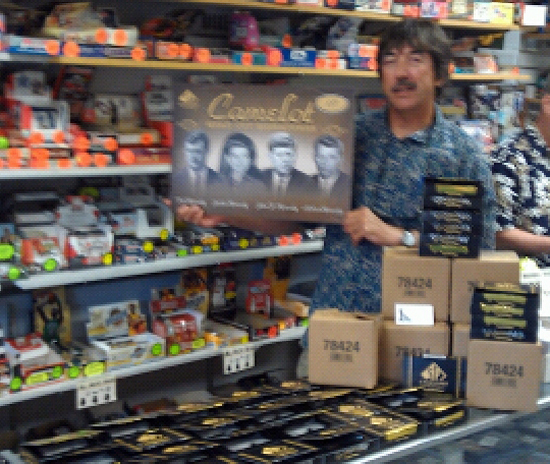 A customer shows off the Camelot cut blow up in front of a lot of the 2011 SP Legendary Cuts product. 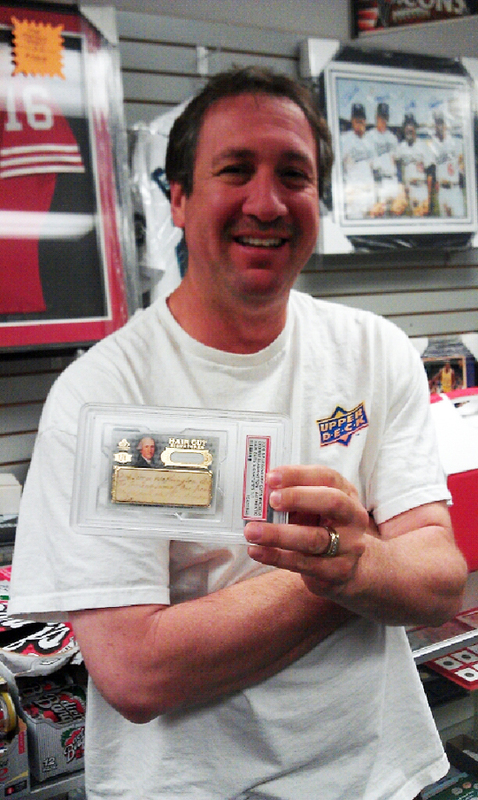 The customer who pulled the SP Legendary Cuts George Washington Hair Cuts card still has it and brought it to share with the group last night. What an amazing card!!! Nice cards there. Is there any chance that Pie Traynor is for trade? 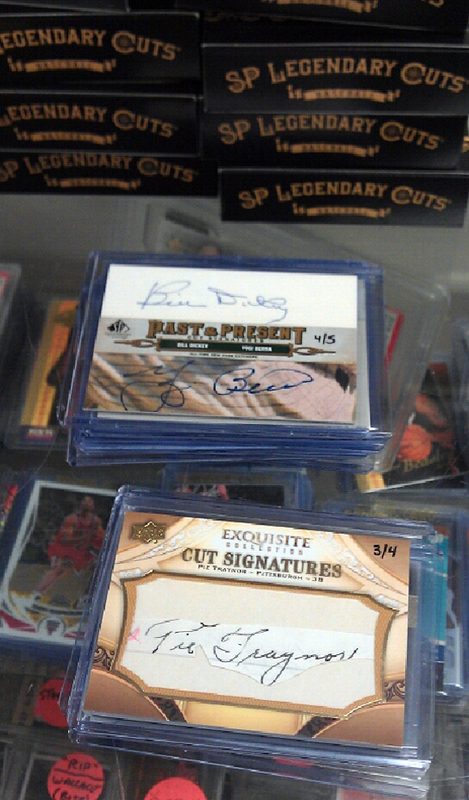 Does anyone know where I can find/purchase an EMPTY wrapper and box from the 2011 SP LEGENDARY CUTS SIGNATURES? I am seeking the empty silver cellophane and the empty black and gold box.